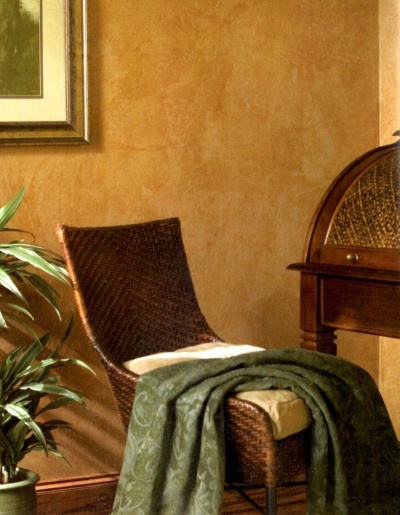 The decorative painting technique of parchment, or frottage, combines Old World texture with a soft yet contemporary attitude. Based on the French word "frotter", meaning "to rub", this method has numerous variations. 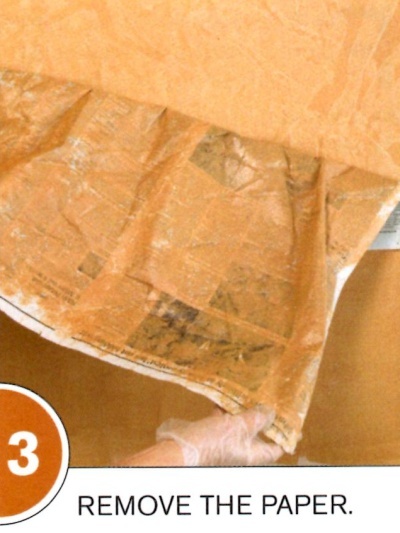 The basic technique involves pressing a flat sheet (of paper, plastic or fabric) into wet glaze and then removing it, to produce a richly mottled surface. The consistency of the glaze you apply for the top coat and the type of sheeting material you choose both affect the final look of the treatment. TIP: for dramatic results use top- and base-coat colors that starkly contrast; for a more subtle effect, pair similar top-coat and base-coat colors. Follow the surface preparation and glaze mixing instructions described in the basic ragging off tutorial, and use the same list of tools and materials to gather your supplies for this project. But instead of the rags, get a few newspapers (ideally the same). NOTE: a little of the newspaper's ink may soak into a light colored glaze, giving it a distinctive accent. But there are differences in the inks - and the amounts of ink - used by newspapers, so test out a few before using one to see what effect is produced and whether you like it. If you don't want the subtle ink deposits, use a pad or two of plain newsprint, which you can find at an arts and crafts store. Keep a supply of extra sheets of newspaper on hand. 1) Start at a top corner (or other logical place), and roll on a section of glaze several inches larger than the sheet of newspaper you are going to use. Roll on the glaze in short, vertical strokes and don't worry if the application looks a bit blotchy - in fact, it will add to the final decorative effect. 2) Using both hands, hold the top corners of a square of newspaper and position the paper so it's level with the ceiling. Press it onto the still-wet glaze. Brush it with your palms down and around paper, until it seems consistently attached to the wall. 3) Curl up the top corners of the paper. With your thumb and index fingers, remove the paper from the wall in one smooth movement, revealing the texture underneath. 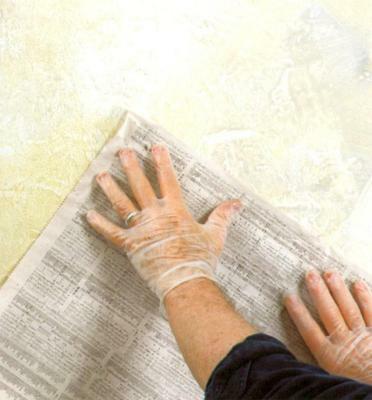 Be careful that the glaze-coated paper avoids contact with the wall. Fold up the glaze-covered paper and dispose of it. 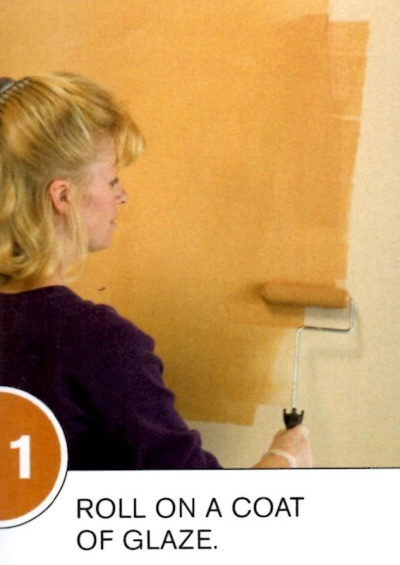 4) Using the same application technique, roll on another section of the glaze and apply a new square of paper to the wall. Allow the applied areas to overlap about 1/2" to create a blended, seam-like effect. 5) Continue working in this manner until the entire wall/room is complete. TIP: for an enhanced grid effect, mark a series of horizontal and vertical guidelines with a pencil, tape measure, and carpenter's level tool to help you keep your lines straight.